Villa Angela features 1 outdoor pool surrounded by floral gardens and 1 indoor thermal pool, all just 800 metres from Citara Beach, on the west side of Ischia Island. Its rooms come with private balconies. Room at Villa Angela are simply decorated and include refreshing tiled floors and wooden furniture. They all come with air conditioning and heating, a TV, and a minibar. Their en suite bathrooms are equipped with a shower and a hairdryer. On site guests will find lots of common areas to relax in, and several massage and beauty treatments that can be arranged at the spa. A children's playground is also available. The on site bar is the perfect spot to relax after a busy day enjoying the island. After the sunset over the Tyrrhenian Sea, the Villa's restaurant offers to guests a mix of local and international dishes. Hotel Villa Angela Terme is just 1.5 km from the historic centre of Forio d'Ischia. Local buses stop just metres away and connect you to various destinations around Ischia. When would you like to stay at Villa Angela Hotel & Spa ? This single room features a balcony or terrace, telephone, a TV and an en suite bathroom. This modern air-conditioned room features a balcony or terrace, a TV and an en suite bathroom. Also included is a telephone and minibar.This room can be configured with a sofa bed or bunk bed, please specify when booking. 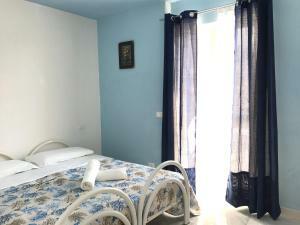 This twin/double room has a balcony, air conditioning and tile/marble floor. This twin/double room features a balcony, minibar and air conditioning. Each day we'll check prices and send you an email for your selected dates at Villa Angela Hotel & Spa. If you don't have specific dates but would like to check prices for say next weekend or say next month we can check the price too. Click to write a review and share your experience of Villa Angela Hotel & Spa with other travellers.